Lebas’ print reproduces ‘The Morning Toilette’, painted by Chardin (1669-1779) in 1741. Many of Chardin’s pictures were of domestic interiors, scenes of childhood and maternal love, all of which were fashionable with 18th-century French audiences. Here, a young girl glances into a mirror. 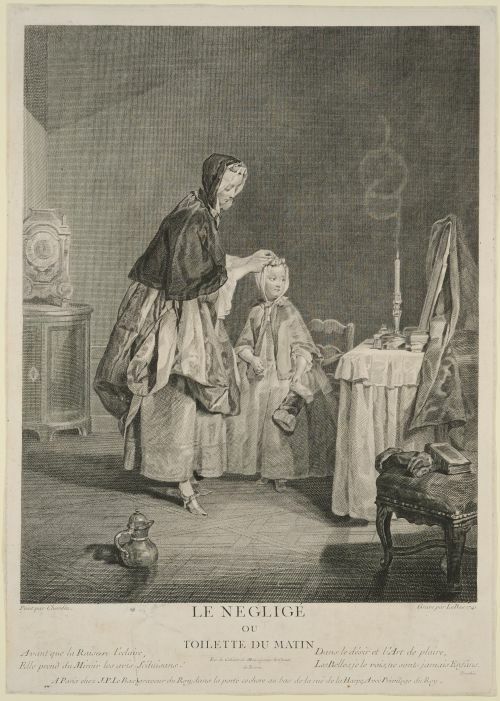 The mother slips a pin into the ribbon on her daughter’s bonnet in preparation to go out. A fur-lined muff les on the stool alongside a Bible, which indicates that their destination is church. The extinguished candle and trailing smoke refer to the passing of time and, perhaps, the inevitable loss of the girl’s innocence. 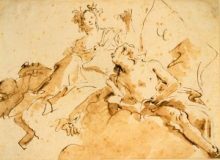 We show a rotating selection of works on paper in our two dedicated exhibitions spaces. If you wish to view a work not currently on display, you can make an appointment to see it in the Prints and Drawings Study Room, which is equipped with viewing lecterns and a study/seminar table.